McDonald’s announced earlier this month that it will transition to using 100% free-run eggs in its Canadian and American restaurants over the next 10 years. While the decision to move away from battery cages is a step in the right direction, animals raised in “free run” conditions do not have access to outdoors and no other welfare issues such as mutilations, procurement, handling, transportation or slaughter are addressed. At all farms, “free run” or otherwise, chicks who will become egg-laying hens are procured from hatcheries. In these facilities, chicks hatch in long steel or plastic drawers. They never have contact with their mothers, no matter how much they cry out for them. Handling by workers is rough and chicks are slammed into metal dividers, scalded to death in industrial washers, and males and undesirable females are ground up alive and fully conscious. The surviving chicks are mutilated without painkillers. All laying hens are killed when their production declines, typically within two years. 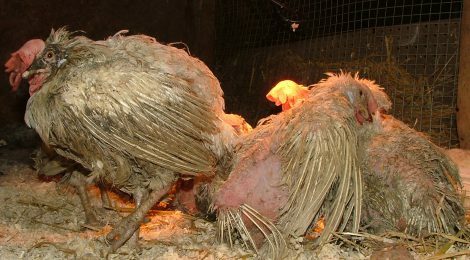 Regardless of whether they are “free-run” or not, hens are routinely starved for up to five days before the day of catching to make them easier to catch. Unskilled chicken-catchers, who are paid by the trailer-load rather than the hour, violently grab hens however they can, ripping off heads, legs and wings; dislocating hips or stomping on them with such force that their internal organs are pushed out. The majority of these chickens are transported to Maple Lodge Farms – one of the few slaughterhouses in Canada that accepts “spent” hens. Maple Lodge was recently exposed for horrific cruelty, including birds freezing to death during transport, workers violently slamming fragile chickens upside down into shackles – breaking their legs and wings, and birds scalded to death in industrial washers. While McDonald’s commitment to moving towards “free-run” barns is a step in the right direction, it falls far below the massive welfare issues egg-laying chickens face.